Kutná Hora (Czech pronunciation: [ˈkutnaː ˈɦora] ( listen); medieval Czech: Hory Kutné; German: Kuttenberg) is a town in the Central Bohemian Region of the Czech Republic. The town began in 1142 with the settlement of Sedlec Abbey, the first Cistercian monastery in Bohemia, Sedlec Monastery, brought from the Imperial immediate Cistercian Waldsassen Abbey. By 1260, German miners began to mine for silver in the mountain region, which they named Kuttenberg, and which was part of the monastery property. The name of the mountain is said to have derived from the monks' cowls (the Kutten) or from the word mining (kutání in old Czech). Under Abbot Heidenreich, the territory greatly advanced due to the silver mines which gained importance during the economic boom of the 13th century. From the 13th to 16th centuries, the city competed with Prague economically, culturally, and politically. Since 1995, the city center has been a UNESCO World Heritage Site. 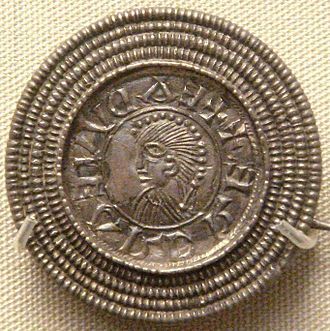 In 1300, King Wenceslaus II of Bohemia issued the new royal mining code Ius regale montanorum (also known as Constitutiones Iuris Metallici Wenceslai II). This was a legal document that specified all administrative as well as technical terms and conditions necessary for the operation of mines. 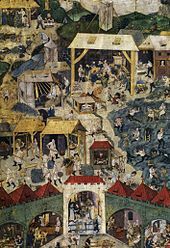 The city developed with great rapidity, and at the outbreak of the Hussite Wars in 1419 was the second most important city in Bohemia, after Prague, having become the favourite residence of several Bohemian kings. It was here that, on January 18, 1409, Wenceslaus IV signed the famous Decree of Kutná Hora, by which the Czech university nation was given three votes in the elections to the faculty of Prague University as against one for the three other nations. 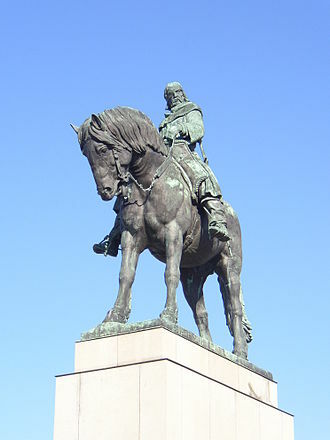 In 1420, Emperor Sigismund made the city the base for his unsuccessful attack on the Taborites during the Hussite Wars, leading to the Battle of Kutná Hora. Kuttenberg (Kutná Hora) was taken by Jan Žižka, and after a temporary reconciliation of the warring parties was burned by the imperial troops in 1422, to prevent its falling again into the hands of the Taborites. Žižka nonetheless took the place, and under Bohemian auspices it awoke to a new period of prosperity. Along with the rest of Bohemia, Kuttenberg (Kutná Hora) passed to the Habsburg Monarchy of Austria in 1526. In 1546, the richest mine was severely flooded. 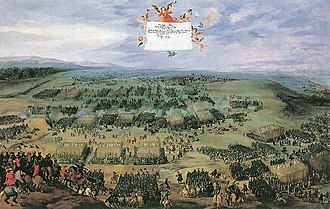 In the insurrection of Bohemia against Ferdinand I the city lost all its privileges. Repeated visitations of the plague and the horrors of the Thirty Years' War completed its ruin. Half-hearted attempts after the peace to repair the ruined mines failed; the town became impoverished, and in 1770 was devastated by fire. The mines were abandoned at the end of the 18th century. In this town, Prague groschen were minted between 1300–1547/48. 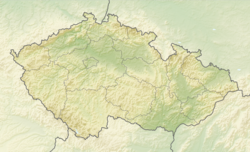 Bohemia was a crownland of the Austrian Empire in 1806, in the Austrian monarchy (Austria side) after the compromise of 1867). 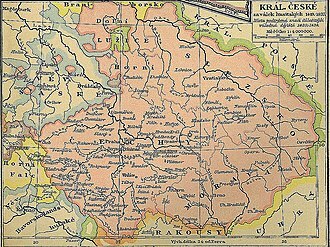 Until 1918, Kuttenberg was the capital of the district of the same name, one of the 94 Bezirkshauptmannschaften in Bohemia. Together with the rest of Bohemia, the town became part of the newly founded Czechoslovakia after World War I and the collapse of Austria-Hungary. Kutná Hora was incorporated into the Protectorate of Bohemia and Moravia by Nazi Germany in the period 1939–1945, but was restored to Czechoslovakia after World War II. The town became part of the Czech Republic in 1993, after the dissolution of Czechoslovakia. 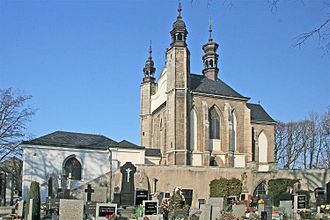 The centre of Kutná Hora and Sedlec Abbey with its famous ossuary are a UNESCO World Heritage Site. Among the most important buildings in the town are the Gothic, five-naved St. Barbara's Church, begun in 1388, and the Italian Court, formerly a royal residence and mint, which was built at the end of the 13th century. The Gothic Stone Haus, which since 1902 has served as a museum, contains one of the richest archives in the country. The Gothic St. James's Church, with its 86-metre (282 ft) tower, is another prominent building. Sedlec is the site of the Gothic Cathedral of Our Lady and the famous Ossuary. ^ "Discover Czech". Retrieved 2007-03-07. ^ "UNESCO page on Kutná Hora". Retrieved 2007-03-07. ^ "Town history". Retrieved 2007-03-07. These wars lasted from 1419 to approximately 1434. 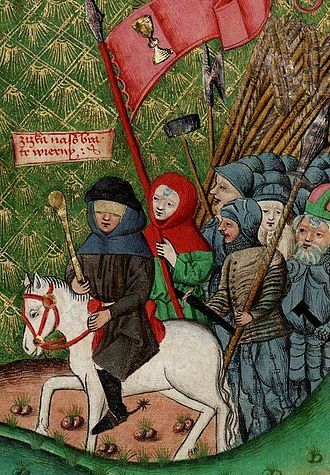 The Hussite community included most of the Czech population of the Kingdom of Bohemia and they defeated five crusades proclaimed against them by the Pope, and intervened in the wars of neighboring countries. The Hussite Wars were notable for the use of early hand-held firearms such as hand cannons. The fighting ended after 1434, when the moderate Utraquist faction of the Hussites defeated the radical Taborite faction, the Hussites agreed to submit to the authority of the King of Bohemia and the Church, and were allowed to practice their somewhat variant rite. Starting around 1402, priest and scholar Jan Hus denounced what he judged as the corruption of the Church and the Papacy and his preaching was widely heeded in Bohemia, and provoked suppression by the Church, which had declared Wycliffe a heretic. In 1411, in the course of the Western Schism, Antipope John XXIII proclaimed a crusade against King Ladislaus of Naples, to raise money for this, he proclaimed indulgences in Bohemia. 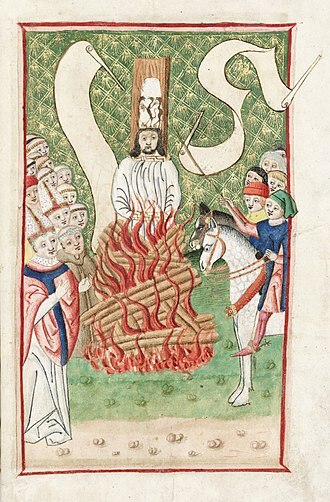 Hus bitterly denounced this and explicitly quoted Wycliffe against it, provoking further complaints of heresy, in 1414, Sigismund of Hungary convened the Council of Constance to end the Schism and resolve other religious controversies. 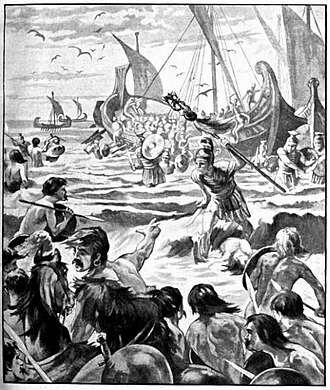 Hus went to the Council, under a safe-conduct from Sigismund, but was imprisoned and this angered Sigismund, who was King of the Romans, and brother of King Wenceslaus of Bohemia. He had been persuaded by the Council that Hus was a heretic and he sent threatening letters to Bohemia declaring that he would shortly drown all Wycliffites and Hussites, greatly incensing the people. 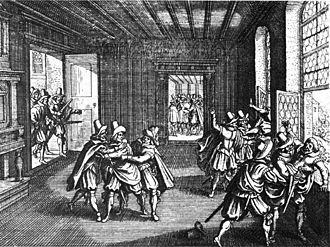 Disorder broke out in parts of Bohemia, and drove many Catholic priests from their parishes. Almost from the beginning the Hussites divided into two groups, though many minor divisions arose among them. This doctrine became the watchword of the moderate Hussites known as the Utraquists or Calixtines, from the Latin calix, in Czech kališníci. 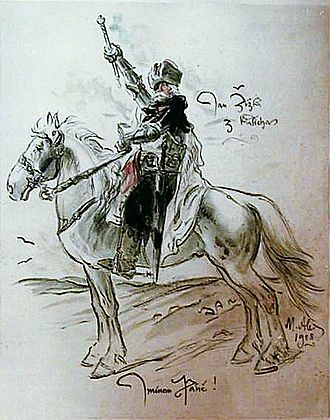 The more extreme Hussites became known as Taborites, after the city of Tábor that became their center, or Orphans, under the influence of Sigismund, Wenceslaus endeavoured to stem the Hussite movement. The Austro-Hungarian Compromise of 1867, or Composition of 1867, established the dual monarchy of Austria-Hungary. 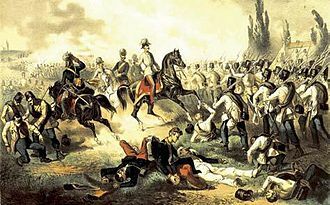 The Compromise partially re-established the sovereignty of the Kingdom of Hungary, separate from, and no longer subject to, under the Compromise, the lands of the House of Habsburg were reorganized as a real union between the Austrian Empire and the Kingdom of Hungary. The Cisleithanian and Transleithanian regions were governed by separate parliaments and prime ministers, the armed forces were combined with the Emperor-King as commander-in-chief. 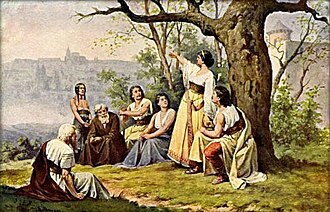 The names conventionally used for the two realms were derived from the river Leitha, or Lajta, a tributary of the Danube and the traditional border between Austrian and Magyar lands. The Leitha did not, form the border, nor was its whole course part of the border. 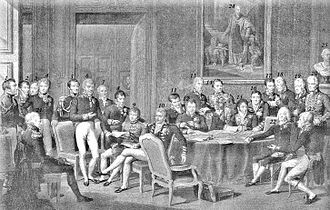 Hungarian political leaders had two main goals, according to Emperor Franz Joseph I of Austria, only three people contributed to the compromise, There were three of us who made the agreement, Deák, Andrássy and myself. 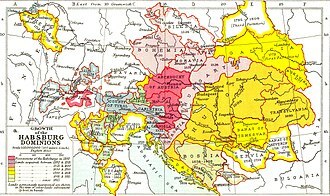 In the Middle Ages Austria was a quasi-independent state within the Holy Roman Empire, ruled by the House of Habsburg, in 1526 at the Battle of Mohács, Hungary was defeated and partially conquered by the Ottoman Empire. 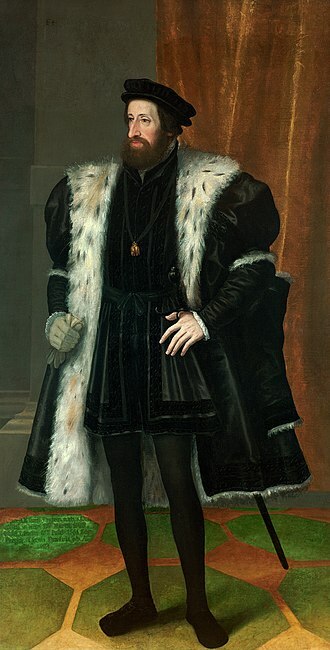 The young king Louis II of Hungary, who had no legitimate heir, the crown of Hungary was inherited by the Habsburgs. The Ottomans were subsequently out of Hungary in 1699. From 1526 to 1804, Austria and Hungary were in a union under the Habsburgs. In 1804, Francis II, Holy Roman Emperor, who was ruler of the lands of the Habsburg Monarchy, founded the Empire of Austria. 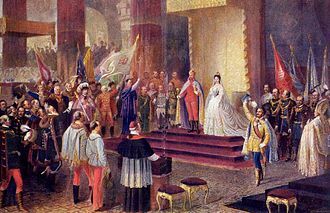 In doing so he created a formal overarching structure for the Habsburg Monarchy, until the 1848 revolution, the workings of the overarching structure and the status of its component lands stayed much the same as they had been under the composite monarchy that existed before 1804. Hungarys affairs continued to be administered by its own institutions as they had been previously, thus under the new arrangements no Imperial institutions were involved in its internal government. Central Bohemia is an administrative unit of the Czech Republic, located in the central part of its historical region of Bohemia. Its administrative center is placed in the Czech capital Prague, which lies in the center of the region, the city is not, however, a part of it and creates a region of its own. The Central Bohemian Region is situated in the center of Bohemia, in terms of area it is the largest region in the Czech Republic. 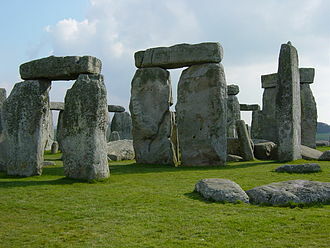 It occupies 11,014 km² which is almost 14% of the area of the country. It surrounds the country’s capital Prague and it borders with Liberec Region, Hradec Králové Region, Pardubice Region, Vysočina Region, South Bohemian Region, Plzeň Region and Ústí nad Labem Region. In 2011, the region counted in total 1,145 municipalities where of 26 were municipalities with a municipal office. 1,044 municipalities had less than 2,000 inhabitants,82 municipalities had a status of town. With an area of 11,014 km², the Central Bohemian Region is the largest region of the Czech Republic, the region has relatively various natural conditions. The highest point of the region is located on Tok hill in Brdy Highlands in the part of the region. The lowest point of the region is situated on the surface of the Elbe River near Dolní Beřkovice. The region is divided into two landscape types, the north-eastern part is formed by Polabí lowlands with a high share of land being used for agricultural purposes and deciduous forests. The south-western part of the region is hilly with coniferous and mixed forests, important rivers in the region are Elbe, Berounka, Jizera and Sázava. On Vltava river, a series of nine dams were constructed throughout the 20th century, the agricultural land accounts for 83. 5% of all land in the region, which 11p. p. The highest share of the land can be found in Polabí, especially in Kolín. There are a number of parks located in the region. Křivoklátsko is the largest and most important landscape park in the region, another remarkable area is the Bohemian Karst, the largest karst area in the Czech republic where the Koněprusy Caves are located. In the Holy Roman Empire it was an Imperial Abbey. The original community was sent to Waldsassen from Volkenroda Abbey in Thuringia, the first abbot was elected in 1133, making this one of the earliest Cistercian foundations. Soon the abbey became one of the most renowned and powerful of the times, as the number of monks increased, several important foundations were made at Sedlitz and Ossegg in Bohemia, at Walderbach, near Regensburg, and in other places. In 1147, Conrad III, King of Germany, granted it reichsunmittelbar status, from the middle of the 14th century, Waldsassen alternated between periods of prosperity and decline. 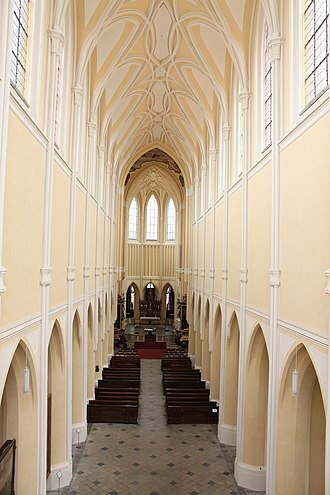 Wars, excessive taxation, and persecution by the Hussites made it suffer much, during the Bavarian War the monastery and farm-buildings were burned, but immediately afterwards rebuilt, and the new church was consecrated in 1517. In 1525, during the German Peasants War, part of the buildings were destroyed, and were restored by Georg III. From 1537 to 1560 in the course of the Reformation administrators were appointed by the authorities, Frederick III, Elector Palatine. 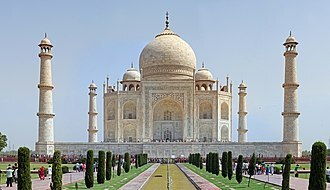 The monks were forced to apostatize or flee, or were put to death. As a result, in 1543, the abbey lost its imperial immediacy to the Electorate of the Palatinate, for about a hundred years it remained in this condition, during which time it was almost completely burned down in the Thirty Years War. 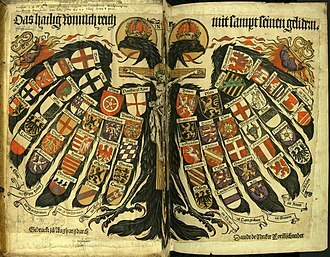 After the Peace of Westphalia Roman Catholicism was restored in Bavaria, in 1669, Waldsassen was restored to the Cistercians, and in 1690 Albrecht, first of the second series of abbots, was elected, regaining control of the abbey, but not its Reichsfreiheit. The buildings were rebuilt in Baroque style after 1681. The abbey became known for its hospitality, particularly during the famines of 1702–03 and 1772–73. 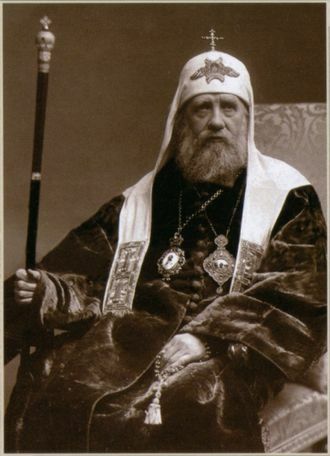 Under Abbot Athanasius science and learning were highly cultivated, when the monastery was dissolved and secularised under the Reichsdeputationshauptschluss of 1803 it had over eighty members, who were dispersed with state pensions from the Electorate of Bavaria. The abbey was sold, and used as a factory for making cotton, at first a priory, the nunnery was raised to the status of an abbey in 1925.